Teufel's Columa 900 5.1 surround sound speaker system, and its smaller brother, the Columa 700, are specifically designed to complement the average gloss black or chrome flatscreen TV. 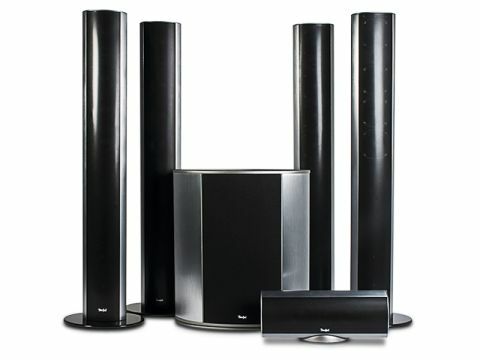 This mid-range home cinema setup comprises four tall towers, a shortened-version centre and an ovoid, upright subwoofer. They're not terribly prepossessing to look at, mostly pierced metal grilles from in front. These don't come off, so the drivers are meant to stay hidden. The Columa towers and the centre unit each house a quad set of small midbass drivers and, crucially, a very high-quality soft fabric dome tweeter that is rated to reach well up to the bat-frequencies for improved breathy, ethereal sounds. With Beowulf, this means Angelina Jolie's sultry voice and Ray Winstone's slightly ruined-sounding growly voice came through a treat. The towers are referred to as Geschlossen (seems like the Teufel German-to-English translator gave up halfway down the specifications list), which means sealed. The centre has the same speaker drivers and is rated to the same frequency passband as the towers but is not able to eat as much power. Interestingly, Teufel use the European DIN standard for power ratings, which is a bit like the CEA ratings used in the USA. Both are scientific ways of shaming the piffle-claims of boastful power you read on some makers' spec sheets. Also, the four small drivers are doing different things. This is because a small driver isn't as good as a big one at doing all the bass and the treble as well. Thus two of them have deeper frequency duties than the other two. Teufel call this 'two-and-half-way' as strictly speaking it'd only be three-way if each set of drivers didn't have overlapping passbands. Forgive me if this sounds a bit techy, but it's all about enabling a diddy set of drivers to put out some real grunt. Teufel seems to be able to do this with ease. The CL 900 SW subwoofer only uses two 8in drivers. It's ported down to the floor, and held off the deck by four rubbery cones. Amplification is just 250W, yet, like the towers, the performance does rather belie the size. This subwoofer has real grip and is perfectly able to raise Grendel-bursting-into-the-Mead-hall levels of boom and bang. Throughout Beowulf, the rest of the system does a lovely job of adding up to more than it should do, with all 20 small drivers doing their thing. Now, there has to be a lot of clever use of sound in Beowulf as, despite this being a state-of-the-art it look an incredible process, motion-capture is still in its infancy. The virtual 'actors' do look a bit Botoxed and their faces only really change a lot in expression between shots, but the sound is close-mic'd with individual booms during the mo-cap process and the rest – Foley, overdubs, orchestra, whatever – is gorgeous. At the conclusion of my first listening session, my notepad wasn't rich with to-the-second movie references, as the whole thing just pulled me in, in a way I haven't experienced in my own room in ages. The combination of 1080p visuals along with the seriously keen soundfield imagery, weight, and melodic grip and growl of the subwoofer (which never, ever coughed even when driven really hard), just transported me. But there were plenty of memorable highlights, including the underwater sequences where the character of the audio has to go all sub-aqua, and suddenly louder as the camera breaks the surface; and a dream sequence which revels in a really scary, immediate crescendo. As Beowulf walks into the cave of Grendel, you can feel the echoic space around the sounds. That the effect came out of an electronic device made by Lexicon (most likely) matters not a jot. It still makes all your hair stand on end. When you watch the movie, see how convincing your system is with these sequences. The Teufel Columa 900 system is able not just to deliver might and power, but those lovely, costly high-frequency tweeters easily create the feelings of space and atmosphere required. Teufel's Columa 900 doesn't have the sheer scale of bigger speaker systems and indeed possibly lacks some real warmth and weight in the lower midband where the drivers are working that bit harder. However, the overall performance is quite out of the league of the price demanded. It utterly stomps on the face of the prettier DLS system that costs over £4,000 – but that system is a designer work of art, whereas this is more function-breeding-form. I would urge those looking for a combination of stark design and stonking performance to look closely at these Columas. A bit like German Audi cars with jelly-mould looks and mad performance – but better value for money!